9 oz. and stretched around and back-stapled to 1-3/8" deep, kiln-dried solid pine stretcher bars. Sizes with a dimension of 24" or longer are braced for additional support. It is ready to use with acrylic paints and other wet or dry media. Apply an additional primer to create an archival surface for use with oils. Looking to stretch your own Linen Support? For artist's interested in stretching their own custom-sized linen painting support, we also offer Premium Belgian Linen from the roll. At a 12oz unprimed weight, with a tight weave, and smooth, regular texture, our Premium Belgian Linen is the ultimate luxury support. 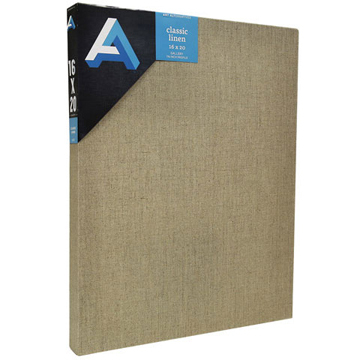 Click here to check out our Canvas Roll page for more information and pricing.